While Aviary Attorney, a stylized visual novel, looks on the surface looks like some woebegotten Phoenix Wright–Hatoful Boyfriend mashup, its actual influences trace back a little further. In fact, the game’s developer pulled them from some public domain images. “I had an urge to give the drawings a new life, so I started work on a narrative-heavy lawyering game that made use of the assets,” Jeremy Noghani, Sketchy Logic’s programmer, designer and writer, recently wrote on Tumblr. 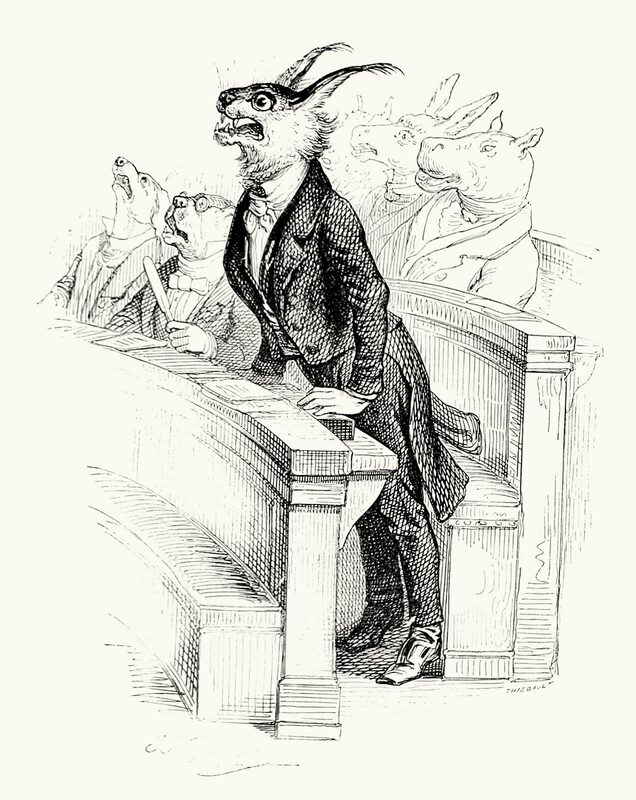 The character’s drawings are taken from Scènes de la vie privée et publique des animaux (Scenes of the Public and Private Life of Animals), a book of satirical drawings illustrated by French caricaturist Jean-Jacques Grandville. For consistency in the aesthetic, Paris révolutionnaire and Paris à travers les âges have been used a source for the maps and backgrounds. Sketchy Logic has compiled a list of public domain sources stumbled upon while working on the game, drawing from sites like Wikimedia commons and Internet Archive Book Images on flickr. “There’s an enormous collection of public domain book illustrations on the Internet,” Noghani said. A lawyering game was not Sketchy Logic’s first idea, however. Noghani explained that the initial plan was to make a card game, an RPG, or a traveling game similar to Oregon Trail or 80 Days. “But then I saw a drawing that looked like a scene straight out of Phoenix Wright, and the design decision became obvious,” Noghani said. You can keep track of the developer’s progress on Tumblr or on Twitter, as well as their recently launched Kickstarter.